Australia Day is one of the most anticipated holidays of the year, offering respite from the couple of weeks of work since the summer holidays (we all love a good holiday!). 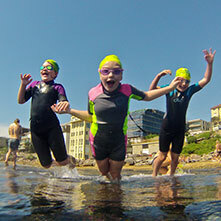 The day also falls slap bang in the middle of the most popular ocean swimming month, meaning there’s a plethora of events capitalising on the public’s migration to the coast over the long weekend. With no less than 13 ocean swims scheduled to run on Australia Day, and another five to round out the weekend, there’s a swim for you, near you. New Zealand is even getting in on the action, claiming three of their own.